Oppo holds a special place of intrigue in many-a-mobile-enthusiasts’ hearts. To say that Oppo is an outliers of sorts is an understatement. While it is easy to argue that today’s flagships have everything the top-of-the-line Oppo Find 7 and Find 7a have, the Oppo devices have enjoyed a more robust build quality than the up-to-now more plastic-clad competition. 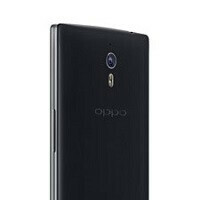 Oppo’s Find 5 from a couple years ago put the company on the map, a sleek unibody design that was among the first of the “5-inchers” to pack a full 1080p HD display. Throw in a powerful Snapdragon CPU and competent camera, and the Find 5 had an allure that was nearly unique among the Android smartphones available at the time. When the Find 7, and its “lighter” cousin, the Find 7a, came to market, there was a lot of anticipation. Oppo had done a wonderful job leaking bits about what the camera could do, and the rumor mill was spinning furiously with what would be top-end hardware driving a stunning experience on what would be a first-to-market quad-HD 1440x2560 display. Perhaps knowing that such a flagship might command too much of a flagship price, Oppo built a twin, the Find 7a, with a more mainstream 1080p display, but still packing plenty of power with the same Qualcomm Snapdragon 801 CPU. The Oppo Find 7 scored largely positive marks in our review, with a couple reservations over the color accuracy of the display and battery life. However, there have been at least two major OS updates since the Find 7 was released. The Find 7a fared even better in our reviews. All told, the latest generation of Find flagships are solid examples of Oppo's design prowess. For the geeks in us, Oppo’s are great devices to have because they are unlocked, bootloader and all, plus Oppo’s community forums enjoy high levels of enthusiast and developer input. For the consumer however, Oppo devices are not necessarily the best deal because no carriers sell them in the US, so they can only be purchased through indirect channels, and that means paying full retail price. One of those channels is a company called OppoStyle, offering the range of Oppo smartphones and accessories. OppoStyle is having a big sale on the Find 7 and Find 7a (international and US compatible variants), taking more than $250 off unlocked devices and throwing in bunch of extras too. For a limited (unspecified) time, you can get a brand new unlocked Find 7 for just $499, more than $290 off. In addition to the device, OppoStyle is also throwing in a screen protector, an iLike Bluetooth headset, an Easy Cover, and a 32GB SanDisk microSD card. The Find 7a is only sale for only $399 unlocked ($266 off), with the same complimentary extras. Both devices will pick up LTE connectivity on AT&T or T-Mobile in the US. Shipping is free for all orders over $200, so that sweetens the deal even more. Has the Oppo Find 7 or Find 7a been on your list, but you just were not sure? It looks like now is the time to treat yourself, check out the source link below to get hooked up. Exactly. I jumped from OPPO back to Samsung. OPPO has great hardware, but lousy software. Jumping back to touchwiz says it all. What is this ? I see crossed $790 price, and highlighted $499. The fun fact is, that it was always $499. You are right ... What a bunch of rubbish phonearena ... You think we do not pay attention on the price? Yeah, right, $790 ... Optical illusion much? First, Oppo doesn't sell their stuff directly in the US. Second, the Find 7 *never* started at only $499 anywhere. Third, there is a difference between a manufacturer's retail pricing, and an indirect retailer. Even if OppoStyle's pricing model is skewed, it is offering free shipping, flagship specs on an unlocked device, with unlocked bootloader, and some nice extras, for $500 or less. That's a deal no matter how you slice it. looks nice.... the price is not bad too. Maybe one day I might give it a try... Maybe ..!! LG G3 is cheaper right now. The 7a a couple of months ago was 399 Euros and don't know how much $. Now that the $ has appreciated so much they are dropping the price in $. Guess it's not such a bargain as it sounds. Will it get Lollipop?